AUDIO LANGUAGE MAGAZINES – OLD – NOT TO BE USED!! language advantage recommends our top audio magazines in French, German, Italian and Spanish. These magazines are great if you’re not using your languages as much as you would like, but want to perfect your language skills. If you already know the basics of a language and now want to improve or maintain your fluency, then Audio Magazine are for you. They will help you take your vocabulary, grammar, listening comprehension and conversation skills to the next level. Each edition you’ll get up-to-date news and views month after month, meaning that you will improve your language skills and cultural skills side-by-side. Work on your French, German, Italian or Spanish while commuting, jogging, walking the dog or doing the housework. Just play the cassette or CD and listen as many times as you like! 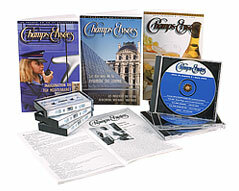 Champs-Elysées French Audio Magazine is hosted in Paris by Georges Lang, one of France’s best-known radio personalities. Each monthly audiomagazine consists of an hour-long programme in French on audio-cassette or CD packed with news, features, and interviews reflecting what’s going on in France. Previous guests on the French programme include politicians Francois Mitterand and Jacques Chirac and actors Juliette Binoche and Brigitte Bardot. The magazine (A5 booklet) containing a word-for-word printed transcript and an extensive glossary accompanies the audio cd or cassette. In addition to translations into English of difficult words or phrases, which are also highlighted in bold in the text, the glossaries contain extensive biographical, historical, political and cultural notes covered in the audio. 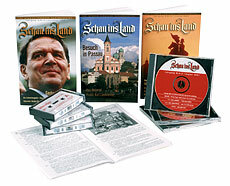 Produced entirely in German-speaking countries by professional broadcasters and journalists, each monthly audiomagazine consists of an hour-long programme in German on audio-cassette or CD. Each edition brings the language and culture of Germany to life as it is packed with news, features, and interviews reflecting what’s going on in Germany, Austria and Switzerland. Boris Becker, Steffi Graf and Helmut Kohl are among the fascinating people who have been profiled in Schau ins Land previously. The magazine (A5 booklet) containing a word-for-word printed transcript and an extensive glossary accompanies the audio cd or cassette. In addition to translations into English of difficult words or phrases, which are also highlighted in bold in the text, the glossaries contain extensive biographical, historical, political and cultural notes covered in the audio. Produced entirely in Spanish-speaking countries by professional broadcasters and journalists, each monthly audiomagazine consists of an hour-long programme in Spanish on audio-cassette or CD packed with news, features, and interviews reflecting what’s going on in Spain and Latin America. Each edition really brings the language and culture of Spain to life – Jose Carreras, Felipe Gonzalez and Julio Iglesias are among the fascinating people who have been profiled in Puerto del Sol previously. The magazine (A5 booklet) containing a word-for-word printed transcript and an extensive glossary accompanies the audio cd or cassette. In addition to translations into English of difficult words or phrases, which are also highlighted in bold in the text, the glossaries contain extensive biographical, historical, political and cultural notes covered in the audio. 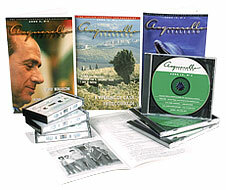 Produced entirely in Italian-speaking countries and hosted by Lao Petrilli, one of Italy’s best-known broadcast journalists, each bimonthly audiomagazine consists of an hour-long programme in Italian on audio-cassette or CD. All articles are presented in Italian by native speakers. Each edition is packed with news, features, music and interviews reflecting what’s going on in Italy. Previous issues include features on topics ranging from politics and current affairs to sports, travel, film, music and opera – including the sculpture collection of the Palazzo Altemps and an interview with the controversial Benetton fashion photographer Oliviero Toscani. The magazine (A5 booklet) containing a word-for-word printed transcript and an extensive glossary accompanies the audio cd or cassette. In addition to translations into English of difficult words or phrases, which are also highlighted in bold in the text, the glossaries contain extensive biographical, historical, political and cultural notes covered in the audio.